In July 2016, a coup attempt against the Turkish government reached a dramatic climax when Turkish President Recep Tayyip Erdoğan called into CNN Turk via FaceTime, urging his supporters to take to the streets. The resulting confrontation between flag-wielding civilians and rebel-controlled tanks changed the course of the evening, and the future of the Republic. According to the CIA World Factbook, Turkey has a 93% cellphone subscription rate and a 95% literacy rate, complementing an already advanced infrastructure for internet commerce. With a young population – over half of Turks are under the age of 30 – e-commerce in the travel, electronics, and retail sectors is thriving, and individual and MMO (massive multiplayer online) gaming is popular. Dr. Ömer Sayan, the president of Turkey’s Information Technologies and Communications Authority (BTK), noted in a recent speech that “the telecommunication sector in our country continues to be strong,” adding that the government’s “2023 Strategic Vision is to become an international center for information and communications technology (ICT) and to provide broadband access for all.” With the implementation of 4.5G (mobile bandwidth technology) in April 2016, the number of 3G subscribers in Turkey dropped to 23.5 million while 4.5G subscribers reached 45.7 million. As Turkey becomes increasingly wired, the government is devoting more resources to grooming its youth for cybersecurity. The BTK organized a “Capture the Flag” cybersecurity competition in January, and is expanding its youth recruitment efforts. “In doing so, we did not seek a ‘diploma or experience’ requirement,” said Sayan. “If we think that the cyber world has become a new battlefield, it is very clear what these youth mean for our country, our state and our nation.” The agency is offering a salary of 6,000-10,000 Turkish lira ($1,644-$2,741) for university students to join a national “hacker army,” an initiative in response to both the country’s 10% unemployment rate and increased distributed-denial-of-service (DDoS) attacks on the government and private sector. But the resources required to impose such comprehensive restrictions, especially on an already-tech-savvy Turkish population, would likely be cumbersome and commercially handicapping. In China, over 40,000 internet police are employed solely to enforce internet laws and monitor citizens’ online activity. Amnesty International notes that China has “the largest recorded number of imprisoned cyber-dissidents in the world” – and yet it is still unable to restrict the flow of information online. The Turkish government, led by the AKP party, has made tech infrastructure and commercial activity a major component of its 2023 Strategic Vision (the year represents the 100-year anniversary of the Turkish Republic). Yet although the country’s ICT ambitions for 2023 are feasible, they will require a substantial amount of financial capital that the country is hard-pressed to attract at the moment. Recent attacks in Turkish cities, including the New Year’s Eve nightclub attack in Istanbul, have slowed foreign direct investment and tourism in Turkey. All eyes are now on the country’s referendum set to take place on April 16. 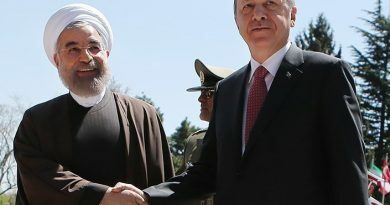 Although many have criticized the attempt to increase the Turkish presidency’s powers, others believe that if the referendum passes, it will provide the geopolitical framework for increased investment and economic growth – in the tech sector and beyond. The author is a Turkey-based researcher and international development consultant.